Archives of Eaton Bray News for June 2005. This article was published in June 2005. Please see Latest News for more recent information. Churches on the South Beds church trails will be opening their doors from 2pm to 5pm this Sunday. Welcomers will be waiting to show visitors around the churches which take part. There are two trails from which to choose - or you could take a closer look at the church on your own doorstep. One trail includes St Mary's Catholic Church, in West Street, Dunstable; St Mary's Church, Eaton Bray; and St Giles Church, Totternhoe. And the second includes St Mary's Church, Harlington; All Saints Church, Chalgrave; St George's Church, Toddington; St Mary's Church, Sundon; and St Nicholas Church, Barton. Churches in Tilsworth, Stanbridge, Leighton Buzzard and Linslade will also be open. Leaflets can be picked up from the South Beds District Council HQ, in Dunstable, from libraries and at the churches. Or download a leaflet from www.southbeds.gov.uk. Time for rhyme at carnival! Don't miss the fun at the St Mary's Village Carnival, for Eaton Bray and Edlesborough, this Saturday. There will be something for everyone, including a colourful carnival procession, worm-charming and displays of belly dancing, kite-flying and basket-making. This year's carnival will be on the theme of nursery rhymes. As always, there will be a contest to find the best-dressed homes on the carnival theme in Eaton Bray and Edlesborough. Carnival Queen Amy Ryder, Carnival Princess Elizabeth Ranson and their attendants, Heather Potton and Grace Shrowder, will lead the carnival procession. It leaves The Orchards, Eaton Bray, at 12:30pm and arrives at Edlesborough Green at 1:30pm. The carnival begins with the judging of the Companion Dog Show, at noon. The belly dancing with Shi'mya and her Utopia dance troupe is a new event. They will dance with veils, finger cymbals, stick and sword to a variety of music styles. And the kite-flying by Gary Tyrell and his team is another new feature. The team, which includes a UK Quad Novice Champion, will be flying American "quad kites", which have four control lines. A chainsaw woodcarving demonstration will be held, with a raffle to win artist Dan Cordell's finished sculpture. Other attractions include an exhibition by the Birds of Bray, and a vintage and classic car, bike and tractor display. Clarabelle the pantomime cow will be at the carnival, too, for the annual contest to guess where she will drop her "message". And there will be a number of stalls, a prize draw and lots of other fun. This year's carnival proceeds will be shared between the St Mary's Church fabric fund, the Dagnall Church extension and other local charities and good causes. There is no charge for admission to the carnival, and plenty of free parking is at hand. To find out more, check out the www.stmarysvillagecarnival.com website. You can also pick out a plastic duck at the carnival for the duck race to be held down the River Ouzel on the following Saturday, July 9th. Tickets are £1 per duck. What has 'Mr Puzzle' won? Puzzle master Gordon Gray didn't have a clue about the special award lined up for him by Rotarians. 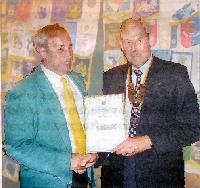 So he really was suprised to be given a prestigious Good Citizen Award by the Rotary Club of Dunstable Downs. That special award was presented to him here by club president John Dent, at a dinner in honour of the charity fundraiser. Mr Gray, aged 53, said: "It was a total suprise." He has been raising charity cash from his annual Christmas word puzzle for 14 years. Puzzle fans who take part make donations to a kitty for worthy causes. Over the years, the puzzle has raised £18,065 in charity cash. The 2004 Christmas puzzle alone raised £3,010, which gave a £300 boost each to WorkAid, Skillshare and Friends of the Animals, and £2,110 to St Luke's Hospice, Harrow and Brent. That puzzle attracted entried from Cyprus and France. Mr Gray, of Northall is a Dunstable Grammar School "old boy" and formerly lived in Dunstable and Houghton Regis. The former Manshead School teacher is a familiar figure in the Eaton Bray and Edlesborough area, through his community work. He joined the St Mary's Village Carnival committee back in 1989 and took on the busy rold of chairman for five years up to 2003. This year, he is organising the procession for the carnival, which will take place on July 2 on Edlesborough Green. Mr Gray is also a reader at St Mary's Church, Eaton Bray, and actively supports young people, including the GIFT (Growing In Faith Together) group. The next Christmas Puzzle will be on a theme based on a poem and is expected to be available from December 8 from the website www.christmaspuzzle.co.uk. Don't panic! The taps won't be runing dry in the Luton and Dunstable area this summer. Despite fears of a national water shortage and looming hosepipe bans because of a continuing drought, the firm running the local water supply is confident that theu'll be able to keep supplies flowing. Following one of the driest winters in 100 years, Southern Water have already had to introduce hose pip bans in the noth of Sussex, the first bans in nine years. People living in Hampshire and the Isle of Wight are also facing hosepipe bans after only 58 per cent of their average rainfall was recorded in the last seven months. The team at Three Valleys Water, which serves South Beds, is keeping a close eye on the situation but don't reckon emergency measures will be needed here. A spokesman said: "The low rainfall has resulted in a continuing decline of groundwater levels and these are below average for the time of year. Even heavy rainfall will not improve groundwater levels"
But because groundwater levels usually hold up well in the first year of any drought - and that's where we are at the moment - short-term supplies are safe. The spokesman added: "We do not anticipate any water supply problems during the summer of 2005. We remain heedful of the situation and would encourage customers to use water wisely over the coming months, both in light of the current situation and in case we have another dry winter next year." Three Valleys Water is spending £5 million over the next five years to study the impact of dry weather on rivers, working in partnership with the Environment Agency and local environmental groups. A really big thank you to everyone in our villages, givers and collectors, for a magnificent £4,014! This is the third year running that our collection total has increased; due to your generosity but also to more people completing the Gift Aid form on the envelope which this year amounted to £1,418. It is always difficult to thank all the people who have helped us, but we would like to record a special thank you to Les Bradbury, who has been a collector for 18 years and is now "resting" - well done Les! Many thanks also to our friends at 'Churches Together' for organising the coffee morning and Christian Aid service. This year's collection is especially important as 2005 is "Make Poverty History Year" and you have responded with a 15% increase over last year's collection, a wonderful contribution. The important fact to remember is that Christian Aid works through partner organizations in developing countries and so gives support directly to people in need - rest assured you all made a difference to our planet. Fireman "saved my horse's life"
A mother-of-three has praised firefighters for saving the life of her precious horse, given to her by her late father. Lita Litchfield, of Edlesborough, was taking her horse Maddie for a ride in a field near Honeywick Lane, Eaton Bray when it collapsed. The 26-year-old mare, which has arthritis in her back legs, could not get back up and Mrs Litchfield feared she would panic and possibly suffer a heart attack. She said: "She landed with a thud and just couldn't lift herself back up again, because of the shock of her fall and the arthritis she has in her back legs I just panicked. We knew that if we didn't get Maddie back up soon, she might have to be put down. "So I dialled 999 for the fire brigade and when they arrived they slipped a strap underneath her to help lift her up. Eventually we all managed to pull her up so she could stand up for herself. "I'm so glad Maddie's still alive. My father, who died last March, gave her to me 14 years ago, so she obviously means the absolute world to me. The firefighters, green watch from Dunstable Fire Station, were amazing. "Even after we'd managed to lift Maddie up, six of them helped me walk her back to the field where we keep her - a good mile away - as a precaution, just in case she fell over again. "I'm so grateful to the firefighters - they saved her life, I'm sure of it." You are viewing the June 2005 archive.